Japanese Episode AG 024: "Hashire Satoshi! Kibania no Kawa o Koete!" American Episode 296: "A Corphish Out of Water"
Now that Heigani is a member of Satoshi's team, the young trainer attempts to introduce the new pokemon to the rest of the group. After greeting its new teammates (accidentally ingesting a piece of debris in the process), the group is attacked by the Rocket-Dan. Heigani actually causes more damage when it tries to help, but despite its goof-ups the group is able to hold the Rocket-Dan off. Haruka sends out her Kemusso, which prompts Musashi to bring out her Kemusso, and soon the two begin arguing about which Kemusso is better. Suddenly, both the Kemusso begin to shine, and they both evolve into Karasarisu! The Rocket-Dan is soon defeated, and after the battle everyone notices that Heigani feels sick. Satoshi decides to rush it to the Pokemon Center, but since he doesn't have his Monster Balls with him he'll have to carry the pokemon on his back. The young trainer reaches a river where a bunch of Kibania reside, and every attempt he makes at crossing it results in him being attacked. Finally, with the help of Pikachu and his now-conscious Heigani, Satoshi is able to cross the river. Heigani is brought to the Pokemon Center and is healed, discovering that the debris it ate was the cause of its illness. The next day, Satoshi and Heigani work together to get his friends out of a trap set by the Rocket-Dan the night before, and everyone sees how helpful Heigani can be. Now that it's feeling better and has proven itself to be a powerful competitor, Heigani can now truly call itself part of the team. The Houen-area episodes are great and all, but one trap that they often find themselves getting into is the reliance on semi-fillers like this episode. What I mean by "semi-filler" is an episode in which absolutely nothing happens for like 90% of the episode, but then the anime producers throw in a capture or an evolution at the last minute to give it that all-important "non-filler" status. The evolutions of Musashi's and Haruka's Kemusso is one such example. If it weren't for that one little gimmick, the entire episode would be written off by fans as "filler." Now this isn't the first time the show's done this. Shoot, if you really think about it, a good half of the pokemon caught/evolved in the Jouto region occurred in what would otherwise be filler episodes. The reason I'm mentioning it now is because Advanced Generation uses this trick a lot, and after a while it starts to get annoying. I mean, it doesn't make sense for the two Kemusso to evolve in this episode--it would have felt better at the end of "Which Wurmple's Which?". Even though this episode is still enjoyable and has other things going for it (this episode can be seen as Corphish's initiation to the group the way "A Tail with a Twist" was for Treecko), it's largely unimportant to the plot. On the dub side, there are no time edits whatsoever, but 4Kids makes up for it with other cuts throughout the episode. The Team Rocket motto looked a little funky in this episode, didn't it? The psychedelic way Musashi and Kojirou had little after-images following them around as they do the motto and the weird faces they make really didn't fit with the regular way in which the dub actors performed the motto, did it? Originally, Musashi, Kojirou, Nyasu, and Sonansu all had some weird pitch thing done to their voices to make them deeper and sound as if they were talking in slow motion. I don't know why they did this, but apparently 4Kids didn't think it was important enough to translate into the dub, so they just performed the motto like always. Isn't it kinda funny how Satoshi just takes the boat that he finds by the river, rides it, has it torn to pieces by the Kibania, and then just leaves it there? That boat has to belong to somebody, right? I can just picture it now..."Oh, I think I'll just take the day off and ride around in my bo--WHAT HAPPENED TO MY FRIGGIN' BOAT!" 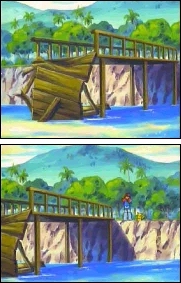 The commercial break in the Japanese version doesn't occur until the scene where Satoshi reaches the broken bridge. 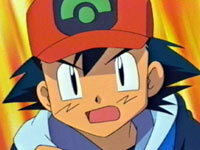 Satoshi runs up to the bridge, we see him stop, Ash says "Oh no! It's broken! ", and then we see get another shot of the bridge. That shot of the bridge is shortened by three seconds in the dub. The Japanese version then cuts to commercial, and when it comes back we get yet another shot of the bridge. That shot, lasting four seconds, is completely cut out from the dub, probably to avoid being redundant. Instead, the dub just cuts to the scene where Ash says "Well, there's only one way to get to Dewford Town." While Satoshi is being attacked by the Kibania as he wades across the river, one of the shots of him getting attacked is cut. It's more or less the exact same thing as the other two shots of him getting attacked that are left in. My guess is that the censors thought that showing him getting attacked three different times were a little too intense, so they decided to cut one of the attacks in order to make it not seem so harsh. If that makes any sense whatsoever. And what's with the noise being made when the Carvanha are attacking Ash? In the part where he says "I...won't let anything happen to you, Corphish! I...promise! You just try and stay strong! ", I swear it sounds like the Carvanha are punching him or something. It's the same sound effect used in the Japanese version, so it's there in both versions. And I'll end the comparison by expressing my joy at hearing the phrases "fighting fit" and "super effective" in the anime.